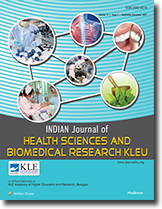 A comparative study of assessing the knowledge of mothers of infants regarding weaning in selected rural and urban areas in Belgaum. Objectives: The objectives of the study were to assess the knowledge of rural mothers of infants regarding weaning, to assess the knowledge of urban mothers of infants regarding weaning and to compare the knowledge of rural and urban mothers of infants regarding weaning with selected demographic variables. Materials and Methods: Simple random sampling technique was used to select the sample for the study. Data was collected by using structured interview schedule. The data was analysed by using descriptive and inferential statistics like mean, standard deviation, mean percentage, median, 't' test and chi-square. Results: The knowledge of mothers of infants in rural area regarding weaning was found to be average and in urban area it was found to be satisfactory. The mean knowledge score was 29.93 with S.D. 3.11 in rural area and 35.97 with S.D. 4.80 in urban area. Growth is an essential feature of life of a child. The process of growth starts from the time of conception and continues until the child grows in to a fully matured adult. Food is a major concern of the mankind beginning from the time of conception and extending through the entire life span of the individual. Nutrition plays a major role during infancy for the growth and development. After the fetal phase, it is the infant period, which accounts for rapid growth. A healthy infant doubles his birth weight within 5-6 months, by the end of a year the child is 3 times its birth weight, and there is an increase in length by 1-year with the increase in length there is also changes in the body proportion. Kidneys attain their functional capacity by the end of the year and also there will be an increase in number of brain cells, which is more rapid in the first 5-6 months after birth. A study was conducted on 60 rural and urban mothers of infants regarding weaning in the selected area of Belgaum. A simple random sampling technique was adopted for 30 mothers of infants from Rukamini Nagar (urban) and 30 mothers of infants from Vantamuri (rural). The sample was drawn through lottery method. The data collected were organized, tabulated, analyzed, and interpreted by using descriptive and inferential statistics. The analysis shows that majority (36.7%) of rural mothers of infants belonged to the age group of 23-25 years, majority of them (63.3%) were Hindus, with regard to education, majority (46.7%) were having primary education, with regard to occupation, majority (56.7%) were House wives, with regard to income majority (60.0%) have income of < Rs. 3000, most of them 70.0% belonged to nuclear family, majority 53.3% had two children, with regard to source of information, majority (60.0%) were getting information from family members/relatives, with regard to nutritional problem faced by baby, majority (90.0%) of the child not faced any nutrition problem. The mean knowledge score of rural mothers of infants on weaning was (29.93), mean percentage was (53.45%) with a standard deviation 5.55 [Table 1]. With regard to rural participants, there is a significant association between the knowledge level of mothers of infants and selected demographic variables such as age group (χ2 = 9.31), education (χ2 = 13.47), and number of children (χ2 = 10.82). There is no significant association between demographic variables such as religion (χ2 = 1.525), occupation (χ2 = 8.60), income (χ2 = 1.17), type of family (χ2 = 0.29), source of information (χ2 = 3.40), number of children (χ2 = 1.80), and nutritional problem faced by baby (χ2 = 1.21). The analysis shows that majority (46.7%) of urban mothers of infants belonged to the age group of 23-25 years, majority of them (66.7%) were Hindus, majority (40%) had high school education, majority (70.0%) were house wives, majority (73.3%) have income Rs. 3000-5000, majority of them 86.7% belonged to nuclear family, majority 66.7% had one child, majority (53.3%) were getting information from family members/relatives, majority (93.3%) of the child not faced any nutrition problem. The mean knowledge score of urban mothers of infants was (35.97), mean percentage was (64.23%) with a standard deviation 8.58 [Table 1]. With regard to urban participants there is a significant association between the knowledge level of mothers of infants and selected demographic variables such as education (χ2 = 36.66), occupation (χ2 = 18.66), and income (χ2 = 25.46). There is no significant association between demographic variables such as age (χ2 = 3.75), religion (χ2 = 7.212), type of family (χ2 = 1.15), number of children (χ2 = 3.46), source of information (χ2 = 8.65), and nutritional problem faced by baby (χ2 = 0.53). [Table 1] depicts that the mean knowledge score of urban participants 35.96 with mean percentage 64.23% and standard deviation 8.58 was high when compared to mean knowledge score of rural participants 29.93 with mean percentage 53.45% and standard deviation 5.55. Hence the 't'value 5.79 was significant at 5% level. Hence urban mothers of infants are having higher knowledge than rural mothers of infants regarding weaning. Based on the analysis of findings of the study, comparison between rural mothers of infants knowledge is more than and urban mothers of infants. There is no significant association between demographic variables such as religion, occupation, income, type of family, source of information, number of children and nutritional problem faced by baby. 1. Ghai OP. Essential Pediatrics. 5 th ed. New Delhi: Mehta Offset Pvt. Ltd.; 2001. p. 1, 56, 64. 2. Sam M, Geetha N. A Textbook of Nutrition for Nurses. 1 st ed. New Delhi: Jaypee Brothers Medical Publishers (P) Ltd.; 2004. p. 96-7. 3. Parul D. Pediatric Nursing. 1 st ed. New Delhi: Jaypee Brothers Medical Publishers (P) Ltd.; 2007. p. 47, 56. 4. Garg P. Weaning advice to mothers: a point to ponder over. Indian J Pediatr 2006;73:108-9. 5. Behrman RE, Kliegman RM. Nelson Essentials of Pediatrics. 3 rd ed. Philadelphia: W B Saunders Company; 1999. p. 64. 6. Dutta DC. Text of Obstetrics Including Perinatology and Contraception. 6 th ed. Calcutta: New Central Book Agency (P) Ltd.; 2006. p. 45.